A practical, proven approach to relieving tennis elbow pain. The 1/8” thick neoprene band provides therapeutic heat to the upper forearm while a ¼” thick orthopedic felt pressure pad applies pressure over the tendon insert point-The Point of Pain: New space-age elastic band wraps around neoprene band providing extra pressure to the forearm. Hook-and-loop fastener allows for comfortable adjustment. Sold singly available in beige only. I have had this support for many years. 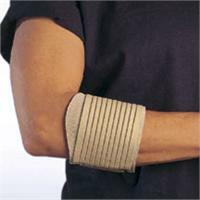 It is the very best elbow support I have ever used! Ordering a new one to have as a spare. I think this is the most comfortable elbow support around.